Night School (Nights School #1) by C. J. Daugherty (in Estonian, borrowed from library) - already read and enjoyed it! I read Strange Angels a really long time ago and enjoy it! :) Hope you do too. I really need to pick up Strange Angels! I found it at a used book store near me, and it was only like two bucks, so I went ahead and bought it. I have yet to read it, but I hope that you enjoy! 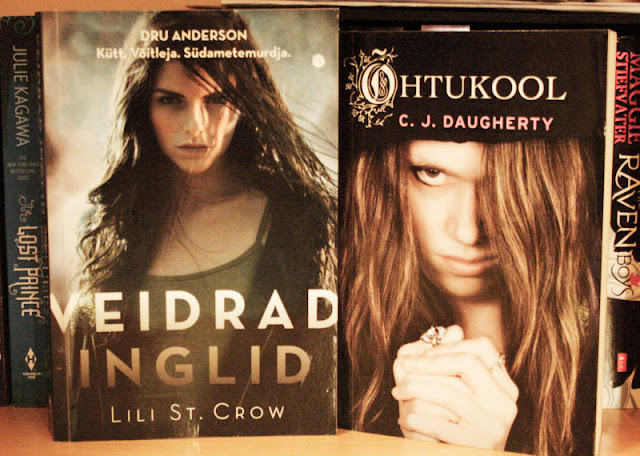 I have not read either of these books but the girls on the covers sure look intense! I'll have to look them up. Thanks for stopping by my list this week. I've heard great things about Strange Angels. I hope you enjoy your books! Night School sounds awesome!! I have heard that the Strange Angels series is good, but I haven't read any of the books. Hope you enjoy! I really want to read Night School, I hadn't heard of it before you brought it up to me that day we were chatting and you were reading it but I looked into it and it sounds like I'll really like it. I bought Strange Angels forever ago because one of my girlfriends really loved the series but I have yet to get to it! Great haul, Siiri!